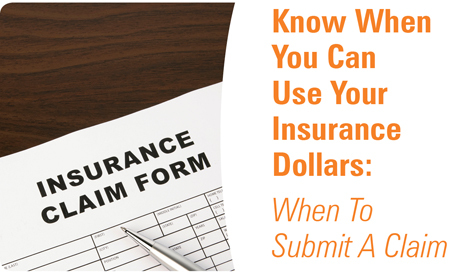 More important than knowing how to submit a claim is knowing when to submit a claim and what type of events are covered under your policy. First, it is critical to understand the purpose of insurance, which is designed to cover losses that are unexpected, accidental, or catastrophic (such as a fire, theft, or natural disaster). Everyday maintenance, for example, is not covered by your insurance policy. Likewise, damage that results from a lack of maintenance may not be covered either. Fixing leaky pipes or an aging roof, for example, are not sudden or unexpected occurrences, and so the homeowner must arrange for these types of repairs before they cause major damage. At the same time, if a homeowner does all they can to winterize their home, then expenses related to a burst pipe will typically be covered. The more a homeowner can do to prevent serious damage to their property through regular maintenance, the better off they will be if a sudden or accidental loss occurs. If you are faced with a loss, make sure to initiate the claims process right away and retain any documentation of the loss and related expenses. If you have any questions about when to submit a claim or about your specific policy, contact your Leavitt Group insurance advisor. Water damage to homes accounts for billions of dollars in losses each year. It is one of the most common and costly disasters affecting homeowners and renters. However, you can protect your home and your wallet by properly maintaining your home and by purchasing the right amount and the right type of insurance coverage. Damages arising from water that comes from the top down, such as burst pipes, wind-driven rain, and ice dams on your roof, are covered by standard homeowners and renters insurance policies. A separate flood insurance policy would be required to cover the damages when water comes from the bottom up, such as an overflowing river. This type of flood policy can be purchased through the National Flood Insurance Program (NFIP) available through the federal government. 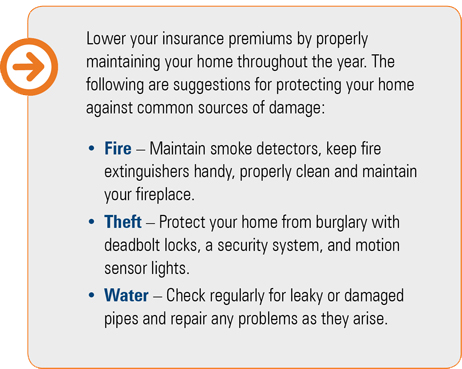 One of the best ways you can prevent water damage is by properly maintaining your home, both inside and out. The following checklist provides tips to help inspect your property and stop water damage before you get soaked. Check hoses and faucets. 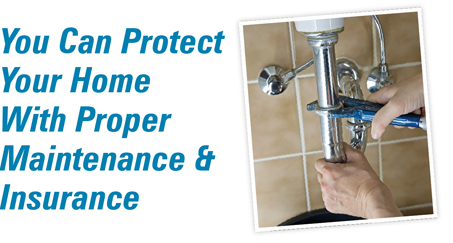 Annually inspect hoses leading to water heaters, dishwashers, washing machines, and refrigerator icemakers. Look specifically for cracks or leaks and replace as necessary. It is a good practice to replace all hoses every five to seven years, regardless of whether they are showing any damages. Inspect sinks, toilets, showers, and bathtubs. Make sure the seal and caulking is watertight and that there are no leaks in the piping leading to these items. Fixing the slightest leak immediately upon discovery can save hours of time as well as money in the long run. If you are going on vacation for an extended period of time, shut off of the water supply to your home. Never leave your home with the washer or dishwasher running. A burst hose in one of these appliances can cause a lot of damage to your home, even in the time it might take you to run to the grocery store and back. Consider installing an emergency pressure release valve in your plumbing system. Should your pipes freeze, a pressure release valve can help control or limit increased pressure and may prevent your pipes from bursting. Maintain seals around windows. The caulking may need to be replaced periodically to maintain a good seal. This will help guard against leaks. Check roof for needed repairs. Replace shingles that are missing, damaged, or aging. Keep downspouts in good repair. Check downspouts and rain gutters regularly and remove debris that may have accumulated. Make sure downspouts are directed away from the house. Maintain sprinklers and irrigation systems regularly. Make sure they are not spraying the walls and foundations of the house. Protect against frozen pipes by turning off the water supply and draining outside faucets in the fall.